Make sure you meet the minimum requirements. Either download or pick up an application for membership at the Town of Fishkill Police Department. Complete the application for membership. 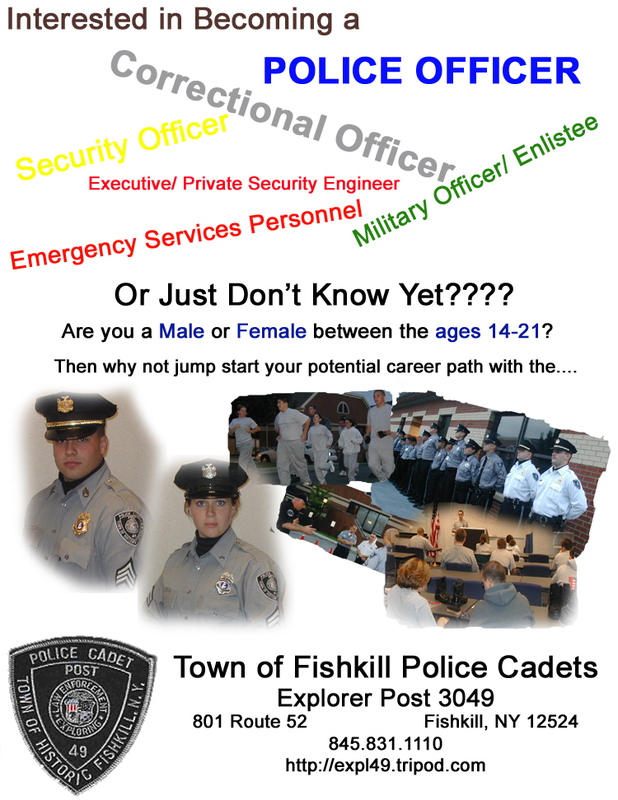 Submit the application with the $10 fee to the Cadet Staff by dropping it off at the Town of Fishkill Police Station at the front window of communications in the main lobby. Wait for a phone call from the Cadet Staff for an interview. Must presently be in high school or a high school graduate or GED recipient. Must be in good academic standing (C or better). Must not be convicted of any criminal offense and must be free of any criminal record. Below is the downloadable cover sheet and application. In order to download and fill out please follow the following steps. First click on the links and save the cover sheet and application to your computer. After you have done this, open the 2 files in Microsoft Word. Finally print the cover sheet and application. If you have any questions please click on the link on the bottom of the page. Interested in Joining or Have Some Questions?